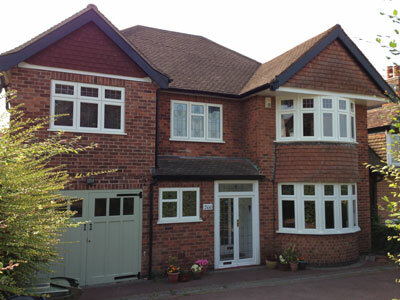 The original timber casement windows in this property in Nottingham were replaced with Evolution Storm 2 timber alternative UPVC wood effect casement windows. The original stained glass was retained by encapsulating it in to a double glazed unit, making it triple glazed. Not only do the Evolution timber alternative windows look authentic, they are also maintenance free and ’A’ rated for energy efficiency as standard.